Geographically, Anatolian Turkey is in Asia and Thracian Turkey is in Europe. A simple glance at a map confirms it. 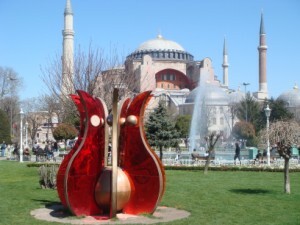 Istanbul is not called the city that straddles two continents for nothing. For commercial convenience, the whole of Turkey is often classified as Europe for such things as travel insurance and flights. Lonely Planet lists Turkey under Eastern Europe and the Caucasus when it is part of neither (apart from Thrace). Is Turkey also part of the Middle East? This is less clear. The Middle East is an ill-defined term that always includes Arabic countries, but may or may not include the nations of North Africa (who speak Arabic) and may or may not include non-Arabic Iran. Where does Cyprus fit in? It’s closer to Asia than to Europe and the Greek side is part of the European Union (nominally on behalf of the whole island but that’s another story). Does any of it matter? Certainly not to long-gone conquerors who marched across Asia Minor from all points of the compass at the drop of a helmet. It only matters to me when trying to catch the weather forecast on BBC World. Auntie Beeb doesn’t seem to know where Turkey is either and generally ignores us altogether. Consider this. Geologically, Europe isn’t a continent at all. It’s an appendage to Asia with an arbitrary border drawn along the Ural and Caucasus Mountains. Those in the know describe the entire landmass as Eurasia. You see? We’re all Asians really. This entry was posted	on Thursday 12 April 2012 at 18:59	and is filed under Turkey. You can follow any responses to this entry through the RSS 2.0 feed. You can leave a response, or trackback from your own site.